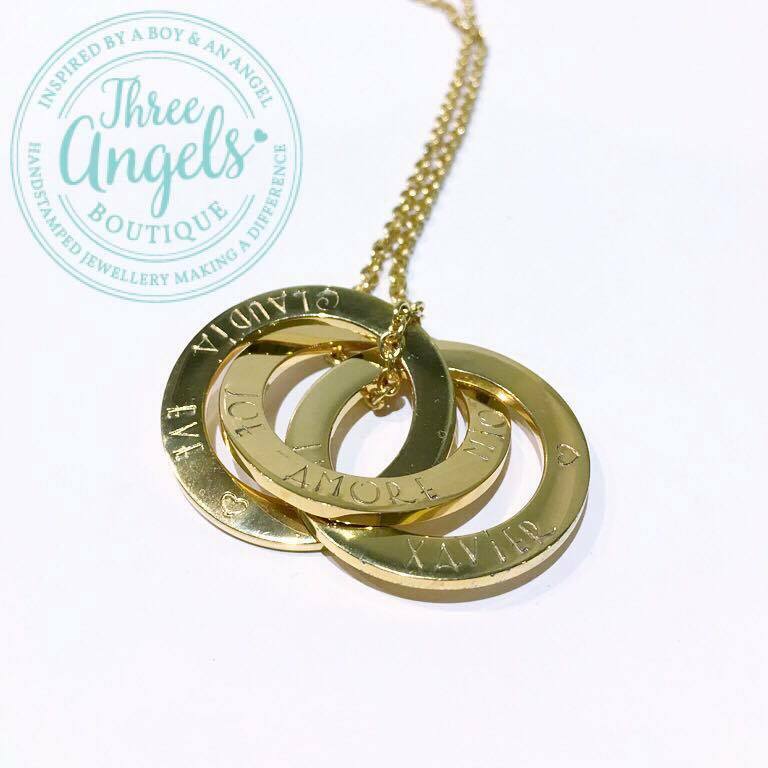 Personalised Name Russian Rings Necklace - Fast Delivery. Exceptional Quality. 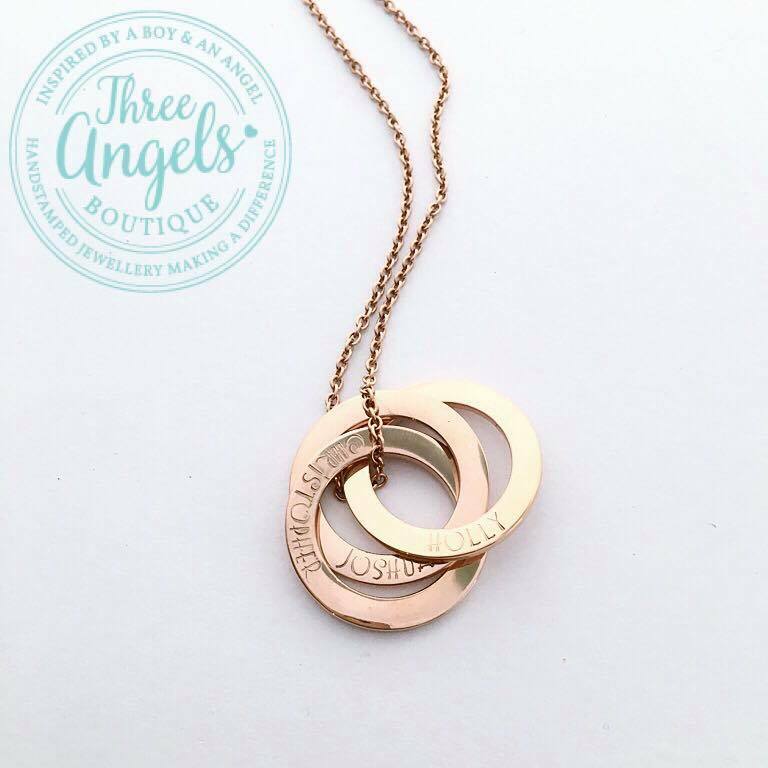 The Russian Rings name necklace is our most popular keepsake piece; available in silver, gold and rose gold colours. 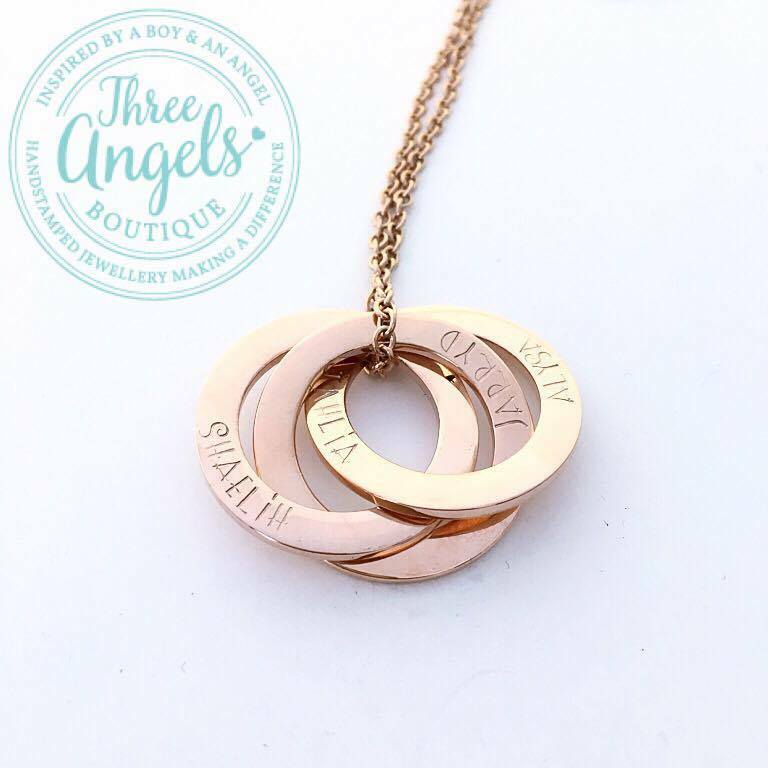 A quality keepsake that will last the test of time as any sentimental jewellery should. 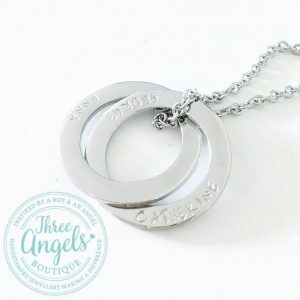 The perfect keepsake name necklace for mothers. 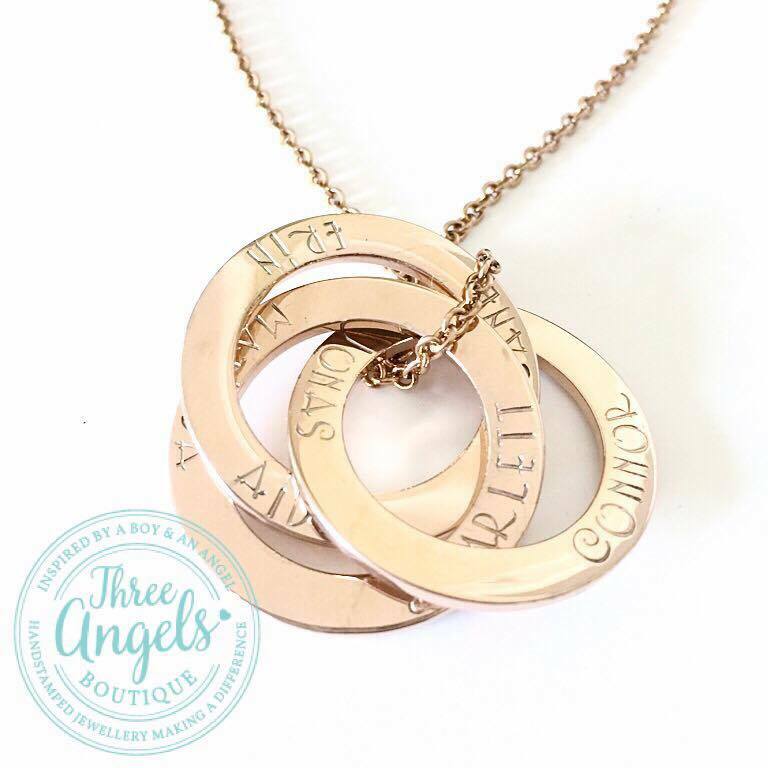 grandmothers, daughters and friends, the Russian rings name necklace can be personalised with names, dates and messages of inspiration and love, intertwined together to represent that love is never ending. 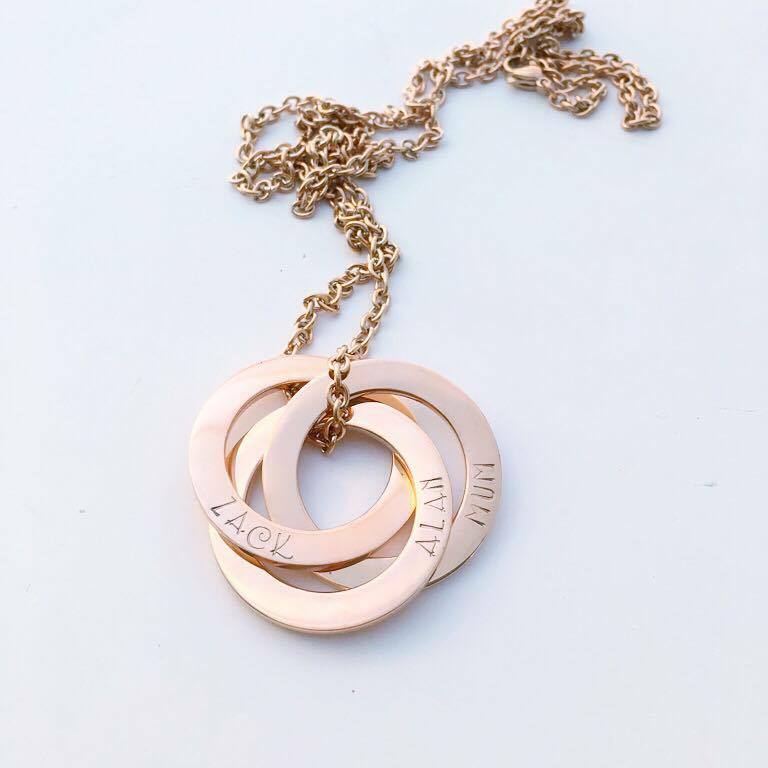 The Russian Rings Name necklace is Created using high quality metals that will not tarnish or change colour overtime, the Russian rings name necklace is made to be loved and cherished forever. 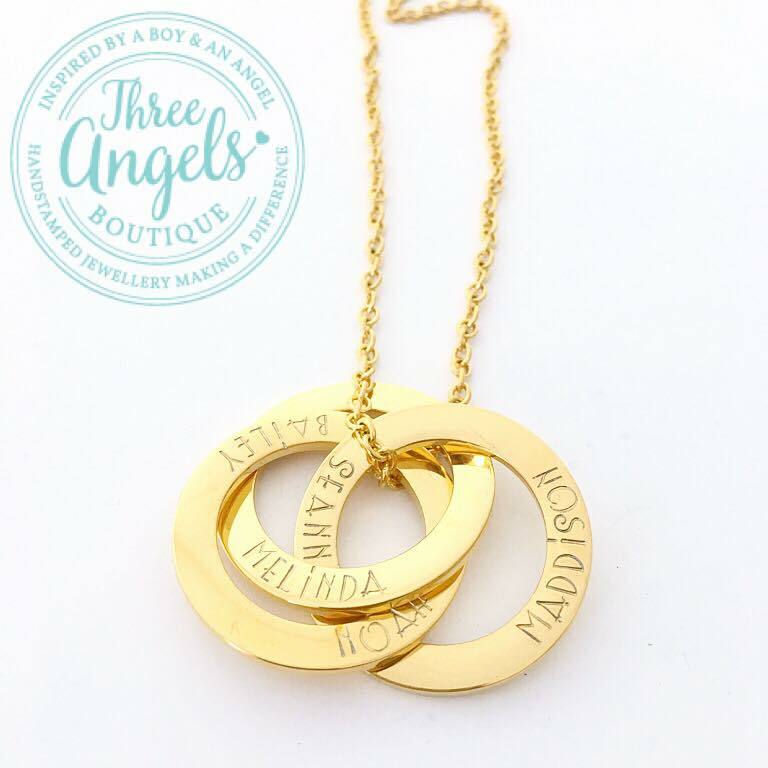 The Russian rings name necklace is a sentimental hand stamped name necklace that is presented in a beautifully presented gift box hand stamped with the three angels boutique logo, and finished off with ribbon ready to gift or treat yourself. 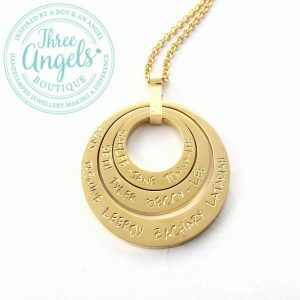 What have our customer thought of their Russian Rings Name Necklace purchase? It is so beautiful, and I’m impressed with how well it’s made . 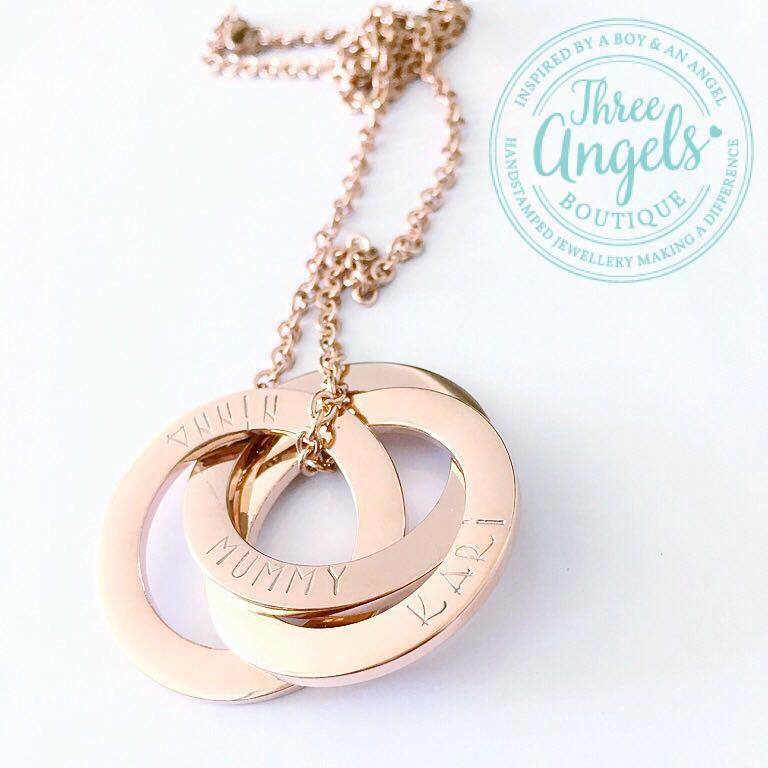 “Love my necklace so much!! Perfect length and size. I have been looking for something like this for ages! My order came much quicker than expected and is beautiful. 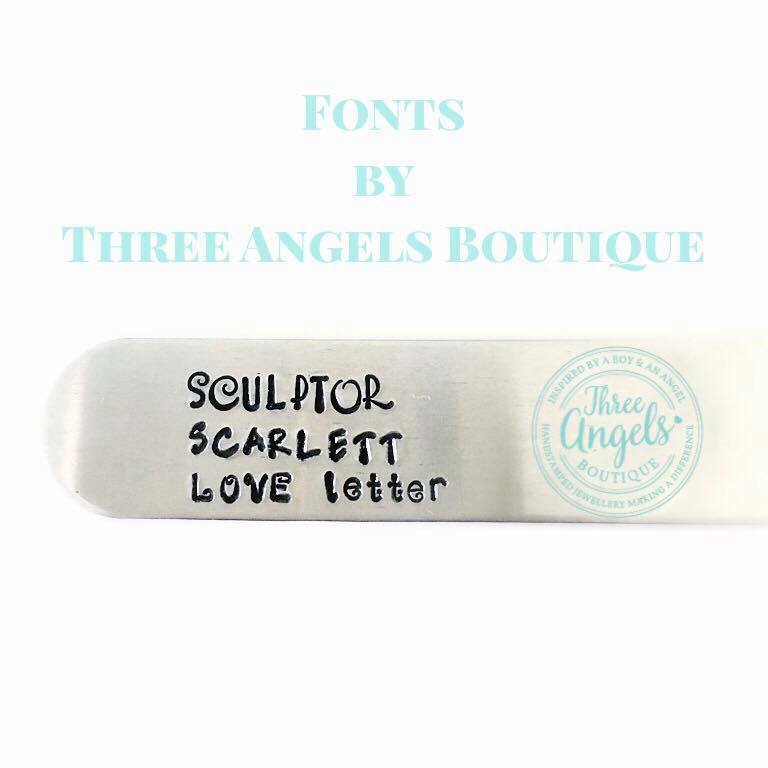 I had a bit of a fussy request for the names and nothing was too much trouble. I also realised I ordered the chain a bit too short and to change it over has been no trouble at all. Highly recommend! I bought this as a birthday present for my best friend. It came in the post super quick and was beautiful! She loves it and I would definitely order again. Gorgeous necklace thank you ! I’ve purchased for my daughters first Mother’s Day and I’m sure she will treasure it always ! I love my necklace thank you! Super fast delivery and amazing quality. I couldn’t be happier with this piece which carries the names of those most important to me. Love my necklace so much!! Perfect length and size. So happy with my purchase, my friend absolutely loves it. And I’m super impressed with your customer service and helpfulness and how quickly you produced and posted my item. Very happy!! Thanks so much again for your help and am definitely recommending you to my family and friends!! 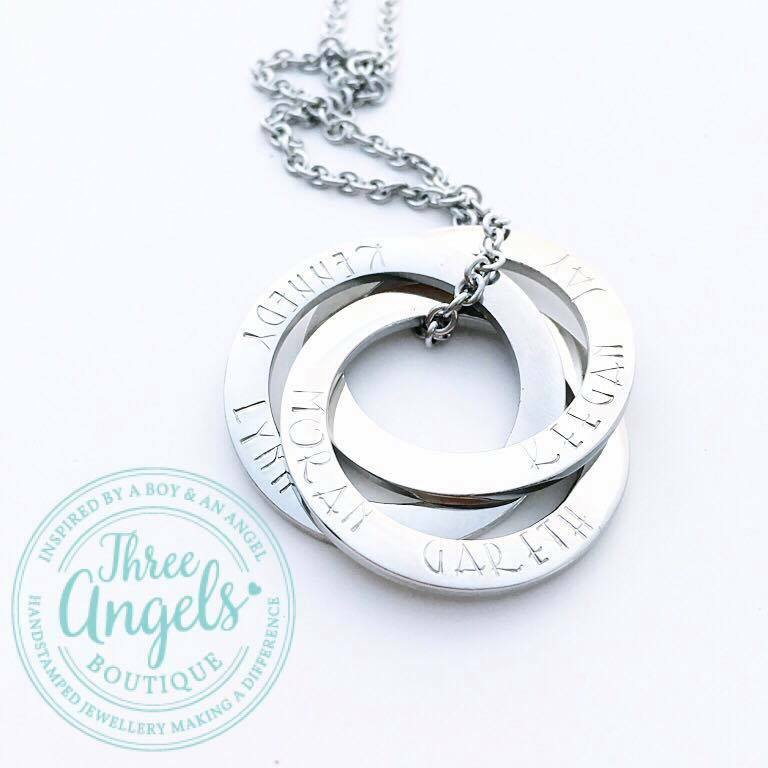 I absolutely love my necklace, personalised with my husband and children’s name on it. 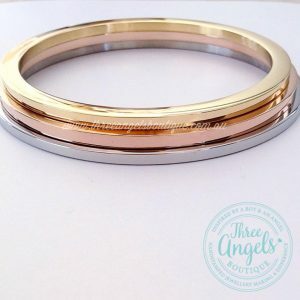 I wear it everyday, and I was only just thinking this morning – it’s so perfect and exactly what I’ve been searching for. You were a pleasure to deal with, and I look forward to recommending this to everyone!